Why do silnylon Tarptents need to be seam-sealed? Silicone-coated nylon (silnylon) tents have to be seam-painted because they cannot be machine seam-taped — Silicone is an inorganic substance that doesn’t take a polyurethane (PU) seam tape. Seam-sealing blocks water from entering the seam holes created when the tent is sewn. The good news is that the silicone is very long lasting, so your tent will only need to be sealed once. We do not include this process in our base cost but do offer seam-sealing kits ($6-8). They include a brush, a glove, and some pre-mixed silicone solution. Keep scrolling for our “How to Seam-seal” video. We also offer a seam-sealing service ($35). The service can add time for your product to ship as it is weather dependent. 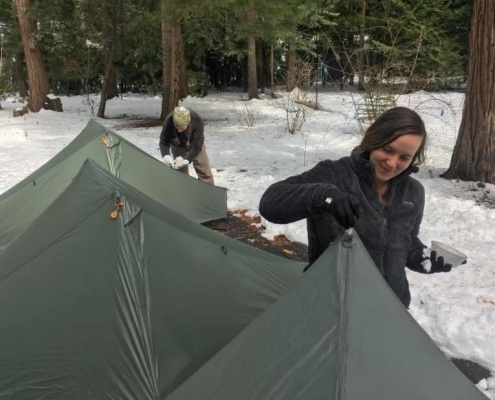 Seam-sealing your own tent is easier than it sounds! We’ve got a video that guides you through the process and a kit that takes care of the hard part for you (mixing the goop). The seam sealant takes 3-4 hours to dry depending on outside conditions. If it isn’t dry by the time you need to bring it in, you can take it down and throw it over a chair for the night. After the sealant is dry, you can “check your work” by spraying the sealed shelter with a hose and watching the seams to see if water leaks in.